Full Description: Dr. Seymour is certified in animal chiropractic by the International Veterinary Chiropractic Association (IVCA) and by the Chi Institute in veterinary acupuncture. 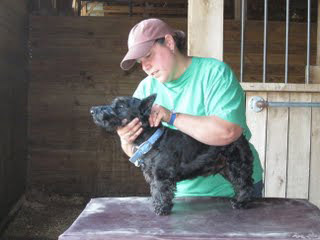 She is licensed to practice veterinary medicine in MN, WI, and Iowa. Dr. Seymour was raised on a dairy farm in southwestern Minnesota. Her love of all animals started at an early age by taking in all sorts of creatures from salamanders to squirrels and feral cats. Her passion for animals lead her to a career in veterinary medicine in which she completed her training at the University of Minnesota in 2008. She then completed a 1 year internship at Stillwater Equine which she deeply enjoyed. During this time she became aware of several integrative modalities and thus pursued training in veterinary acupuncture at the Chi Institute in Florida in 2010 and animal chiropractic at Options for Animals in Kansas in 2011.